This past season saw Safari Club International publish an article in the May/June issue of the SCI Magazine, on a hunt with John X Safaris. The story was written and submitted by our good friends, Steve and Lisa Dahmer, who joined us on safari during 2011. Many of you would have read the story in either the magazine or right here on our John X updates. What you would not have seen is the hunt itself – at the time Carl filmed the hunt, but has since not gotten around to having the footage edited. This week we finally got around to editing the footage – our apologies Steve and Lisa – here’s our adventure and story – as promised. Enjoy! “There’s our boy! Now that’s a trophy Eland!” Our PH, Carl Van Zijl of John X Safaris, was almost giddy as he continued to stare through the spotting scope. The bachelor group was on a mountainside about a mile away in the midst of the Great Karoo country of South Africa’s Eastern Cape. They had chosen their midday abode wisely. Alternately snoozing and nibbling at assorted vegetation, the loosely clumped band faced every possible direction in some moderately thick Acacia and Wild Olive. They were on a small bench surrounded by much heavier brush with escape cover in three directions and were positioned high enough on the mountain to easily spot any suspicious activity in the valley below, or on the more open ridges across from them. The difficulty of the Eland’s chosen position wasn’t lost on Carl. The valley was wide and much of the lower country relatively open, making a stalk from below all but impossible. The mountain bowl rose steeply behind the Eland, and the open valley gave way to ever-thicker brush mixed with some intermittent cliffs on the higher slopes, which made a successful approach from above equally improbable. One low ridgeline splitting the wide valley seemed to offer some hope, but it still appeared too far and too open to cut the distance we needed. It seemed this group of bulls had selected a perfectly unapproachable location. While Carl and our other PH, Juan MacDonald, discussed the options, I turned to my wife, Lisa, and saw a mixture of excitement, doubt and concern in her expression. “You ready for this?” I asked. “Yes. I’ve just got the jitters as usual, but I’m a little nervous about this video camera business,” she confessed. The “video camera business” she referred to was the large professional-grade unit Carl had brought along to film this very special Eland hunt. When I began planning this mixed-bag safari with my good friend, Paul Brisso, over a year in advance, Lisa had expressed interest not only to come along, but also to do some hunting herself. Since this would be her first trip to the Dark Continent, I printed out a comprehensive photo list of the species available in the Eastern Cape and asked her to pick out two or three that most intrigued her. One quick glance through the pages and she immediately fingered a Cape Eland as her first choice. I always enjoy the irony of her selection—Lisa stands all of 5 feet tall in her boots, and she picked the largest spiral-horned antelope on the continent as her first quarry. When we arrived at camp and relayed that story to Carl, his eyes brightened and a broad smile came over his face. You see, Eland hold a special place in Carl’s heart, and he has been trying for quite some time to video a lady hunting one of these regal animals, but to date, none of his female clients had been willing to go on camera. Lisa too, was reluctant, and we had discussed Carl’s request at length, but hadn’t reached a final decision. When Carl and Paul rolled into camp the fourth evening of our hunt with news of finding an exceptional Eland, Carl reiterated his request to film the hunt. I was a bit surprised when Lisa happily nodded her agreement to go on camera without the least hesitation. That was last night. Now that she’d had time to consider her decision, and with a stalk on a trophy Eland seemingly imminent, she was beginning to have second thoughts. Her mixed emotions were expected—Lisa admittedly gets excited when hunting, particularly when she is to be the shooter. But this situation was quite a lot more. Now she would be the center of attention and expected to make a possibly long shot, not only with me watching, but with two PH’s assisting, a truck full of trackers and skinners watching from afar, and a camera rolling to show the world every detail of the events for years to come. That reality was beginning to sink in. “Just remember all our practice time on the range. You know what you need to do and you already know you can do it,” I offered, trying to ease her pre-game jitters. “You are an excellent shot, so just focus on the animal and put those cross-hairs on the shoulder where they showed us, and you’ll do fine. “Even as I said it, I knew my words wouldn’t belay her fears. Lisa was facing the test all hunters must face, and it was entirely up to her to control the emotions, block-out any distractions and get the job done. Having seen her at the range and on big game in our home state of Colorado, I had every confidence in her, even though she was questioning herself at the moment. “OK, let’s go!” Carl’s excited voice startled us both, as he grabbed the video camera and started hiking down into the small spur valley. Juan had shooting sticks in hand and explained the gist of the plan as we hiked toward the central ridge separating us from the band of Eland. The initial plan was to gain a vantage on the middle ridge to get a better look at the bulls and surrounding terrain to see if there might be a way to close the final distance. It wasn’t much, but it was a start, and seemed to be the only reasonable option under the circumstances. Gaining the middle ridge was fairly easy as distance, wind and topography were in our favor to that vantage. As we wriggled to the top through a sparse patch of brush growing amid ancient, jutting bedrock protrusions that formed the spine of the ridge, we could see the bulls hadn’t moved much in the time it had taken to cross the first valley. Unfortunately, the rangefinder indicated the eland were still over 600 yards away, and our view of the vegetation and topography that remained between us was not very encouraging. The second valley was similar to the first, but deeper, a bit wider and more sparsely vegetated, and there were no more topographic anomalies to allow us to proceed. We were stuck. While we waited for the herd to make a move, Carl took a moment to film a brief interview with Lisa, and explain the intricacies of field-judging this species. Being an Eland connoisseur, Carl feels the standard scoring systems are woefully inadequate to properly evaluate a trophy Eland. Of the six bulls I watched through the binoculars while Carl explained all this, I could see one that had all those features in spades. At first glance, even to the untrained eye, this bull stood out among the rest. First, he was clearly larger than the others, with an enormous, swinging dewlap, deep chest, sagging belly and lumbering gate as he walked. Second, he was notably a steely, blue-gray color with black patches lining his shoulders and the back of his legs, which accentuated his distinctive appearance. The other bulls showed a hint of the bluish-gray coloration, but were generally a more creamy-tan, or dead-grass color. Third, he had a striking facial pattern owing mainly to his jet-black nose abutting the robust, rufous-colored tuft of hair covering his forehead, another feature the other bulls were beginning to show, but nowhere nearly as distinctively as our intended quarry. Finally and perhaps most notably, were his horns. They were massive. Even at 600+ yards with only field glasses I could see the ridges of his spirals, the narrow gap between the bases, and good length when compared with his cohorts. Best of all, in profile the horns curved forward, reminiscent of a Lord Derby Eland, lending unique character to this old warrior. Our discussions were interrupted by a shift in the winds and we decided it best to back out of our location and circle farther up the ridge to play it safe. This part of the stalk required some careful crawling in very sparse cover to avoid detection, and Lisa earned her stripes negotiating a broad stretch of rough, rocky ground strewn with an abundance of prickly vegetation. Once we had safely crossed the open ground to our new position, the Eland inexplicably shifted their feeding route and promptly reversed course, eventually crossing another of the many finger ridges to the next sub-valley in this huge basin. Once the entire herd was over the top and out of sight, we immediately lit out at a good clip to cross the broad, open valley, thankful that no Gemsbok, Baboons or other animal herds had wandered into the area to complicate things further in this game-rich area. As we scaled the final ridge, we were careful to come over the crest well-above the area where the herd had crossed, and hugging brush cover on the skyline to mask our movements. This was not the time to get careless. As we peered over the ridgeline, it took a bit of glassing to re-locate the herd, as this basin was more heavily vegetated. But we were in luck as the bulls had relaxed and were feeding intently about 200 yards below us. Once we’d picked out the old monarch, Carl got set to film as Juan settled the shooting sticks and Lisa eased into a sitting position against a large boulder. As I watched from a few yards behind, I could see the hours of shooting practice paying off as Lisa simply turned off the nerves and got down to business. Once seated, she had her little .260 Remington Mountain rifle on the sticks and the crosshairs settled on the bull’s shoulder in one fluid motion, and I couldn’t detect the slightest movement in her barrel.“Exactly 196 yards,” Juan whispered, looking through his rangefinder. “Take him right in the shoulder whenever you are ready.” The bull had turned slightly and was nearly broadside when Carl affirmed he had the camera rolling. With clearance from both PH’s, Lisa simply touched off her shot and quickly cycled another round. We all heard the clear “whuuump” of a solid hit, and the giant animal immediately leaped and reversed direction with surprising speed and dexterity. The entire band was hastily making an exit down-slope to our left, and the boss tried valiantly to keep pace with his mates, but Lisa’s perfect shot placement had deflated his lungs and put his pump out of commission. He only made it 40 yards before collapsing in a heap. Both Carl and Juan pronounced triumphant congratulations simultaneously, and the emotion of the moment was palpable as Lisa began to literally shake with excitement. 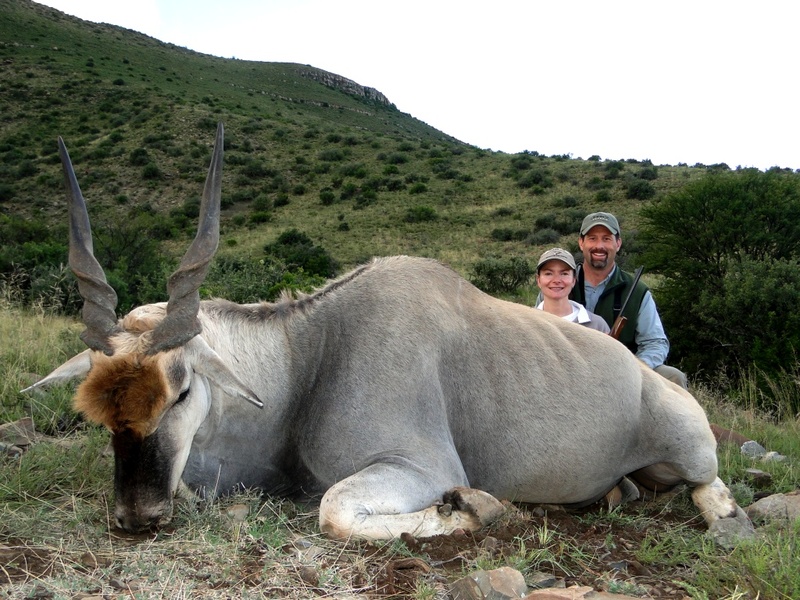 My diminutive little lady had taken a giant of an Eland, and by far the best trophy of our hunt. For more information and current updates about John X Safaris; follow us on Twitter, connect with us on Facebook and visit our Website!